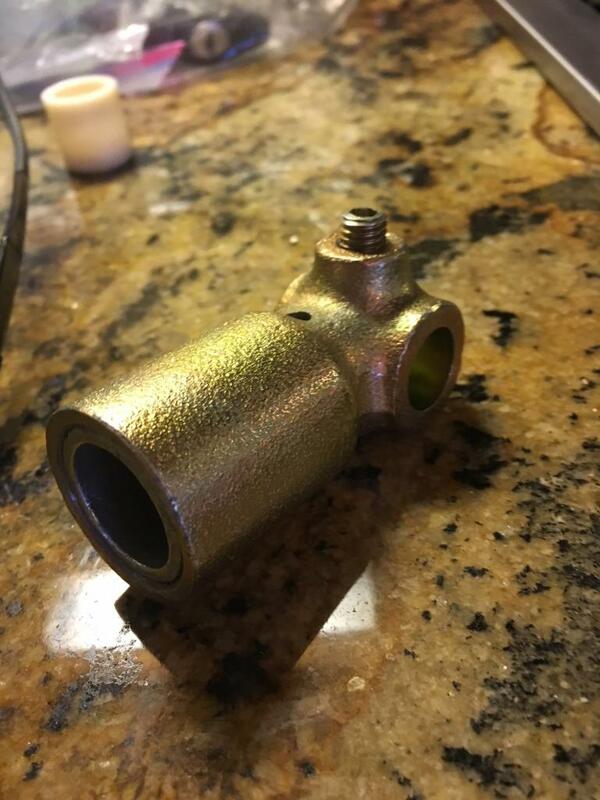 WTB:SHIFT ROD END FITTING, with brass insert ? It looks like a bronze cup bushing insert instead of a plastic cup bushing? Look deep inside to see if it's hemispherical at the bottom. It's not a cup insert. It's shaped like a Conduit Coupling and is hollow all the way through. When we put it on the ball shifter it's a little loose so not sure that's an ok fit ? I do have all new bushings including a new ball cup bushing. I’m wondering why I couldn’t just use what I have if it’s a bronze insert ? If it IS an bronze insert, look to see if it has a hemispherical shape milled at the bottom. 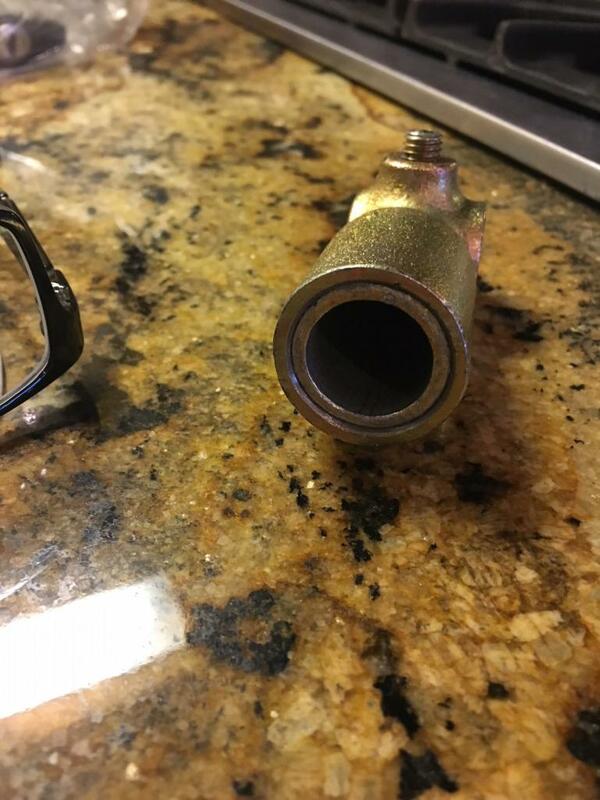 Is there a source for a brass or bronze replacement ? I'm going to guess the insert doesn't bottom out to allow space for free movement of the ball end. Otherwise, you have in effect a rigid 90º joint - something has to give in the fore/aft lever motion. AFAIK, your other plastic/nylon shift bushings may be distorting to compensate for that rigid joint. The slop you feel is the planned space between the lever and that metal bushing. Suggest removing the bushing and install the factory nylon ball socket to reduce the excessive play. Never seen a brass insert. Thinking it is a custom made piece. I've never seen a metal insert for this bushing either. not sure how well it would work? at full range of motion, the bushing pulls out about halfway from the cup and the bottom half of the bushing is unsupported. I run a modified cup in my race car to improve this situation. A ring is welded onto the cup making it a deeper fit. The ring is then machined smooth internally on a lathe. Additionally the two (180 degree apart) edges of the cup are notched to allow full range of motion by the linkage at full extension. probably have a picture in my thread somewhere. someone put that hollow insert into the cup to keep the plating off of the inside surfaces of the cup where the bushing needs a smooth face. I'm guessing the plating on the outer lip has bonded that insert into that cup. break the bond and it will likely slide out. To remove stubborn bushings, I put the coupler in my chest freezer over night. The bushing shrinks concentrically, and comes out with one tap.